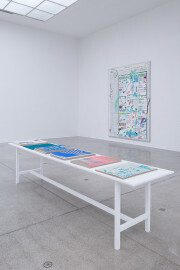 Laura Owens belongs to a generation of artists who are reshaping the discourse of contemporary painting with their technical expertise and love of experimentation and, perhaps most importantly, through the involvement of digital media and image editing technologies. 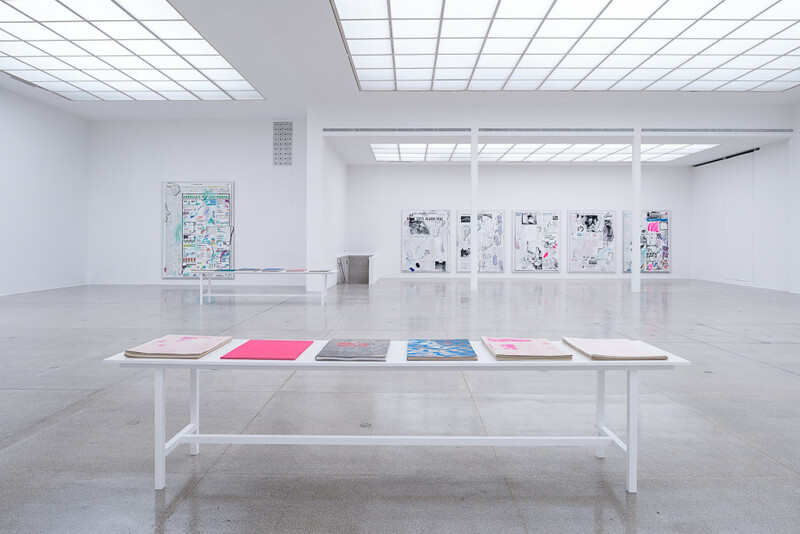 The Los Angeles-based artist’s paintings first attracted attention in the late 1990s; she quickly rose to wide acclaim and, in 2003, became the youngest artist ever to be honored with a retrospective at the Museum of Contemporary Art, Los Angeles. 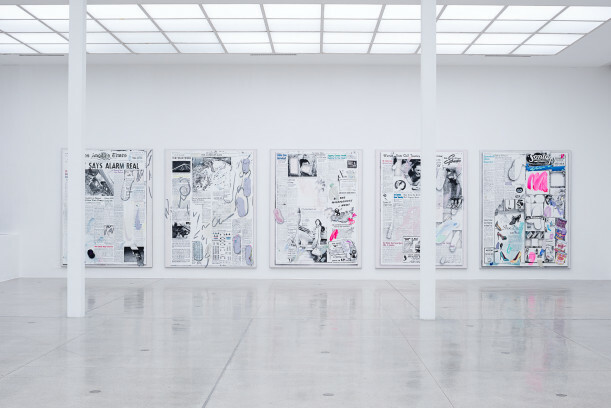 Owens is known for her large formats and a specific visual idiom inspired by references to art history, borrowings from popular and vernacular culture, and the visual traditions of non-Western cultures. 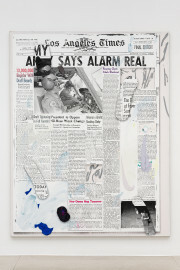 On the formal level, her work has always been distinguished by combinations and superimpositions of different techniques, media, and motifs. She prints, paints, and sprays on her canvases, embroiders them and pastes elements and, in some instances, entire objects onto them. Owens also uses digital technology; art and image editing applications are no less part of her repertoire than more traditional tools. Her approach to painting entails a permanently evolving visual language; extensive preparations, studies, and technical experiments are characteristic of her creative process. By the time the work on the canvas proper begins, the essential parameters of the painting have already been determined. Owens’s pictorial spaces are complex compositional constructions defined by a layering of planes that alternate between formal and thematic references. 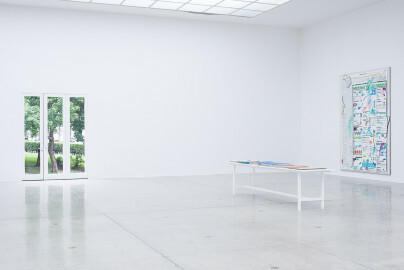 Owens also regards painting as a medium of spatial and bodily experience. She often arranges her pictures to initiate a dialogue between her art and the exhibition space with its specific architecture. Dimensions, proportions, or characteristic design elements frequently find their way into the creative process, informing her decisions about canvas formats, graphical proportions, or modes of installation. The physical presence of her large paintings challenges the viewer to engage with them in an interaction that is no less vividly physical than the artist’s work on them: he or she must approach them and step back or walk along them to fully take them in. 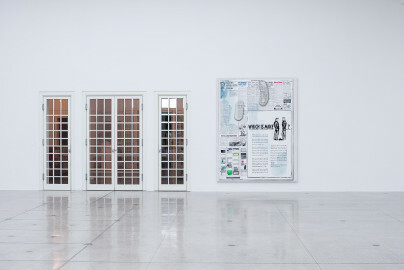 Her most recent works seamlessly combine her interest in the “picture within the picture,” a traditional trope of art history, with the ubiquitous aesthetic of screens, in which the simultaneity of adjacent and overlapping “windows” showing different content feels completely natural. 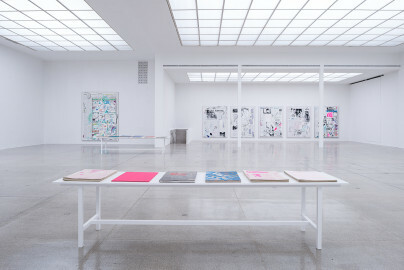 The conjunction of digitally manipulated graphical elements and the analog technique of silkscreen printing has emerged as a major theme in her art and brought a new look to her art that is also the dominant aspect of the most recent series of paintings, produced specifically for her show at the Secession. 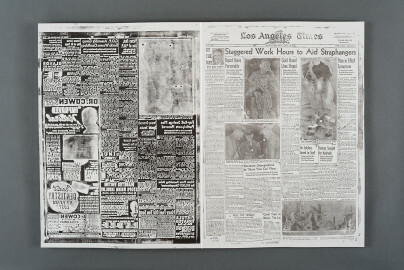 After working for several years with vintage newspapers from the 1960s such as The Berkeley Barb and The Los Angeles Times, Owens serendipitously found a set of newspaper stereotype plates that had been repurposed as flashing beneath the shingles siding her Echo Park home in Los Angeles. These paper negatives were originally made to cast the lead cylinders used on press, and all came from editions of The Los Angeles Times printed over a one-month period in 1942—the year the house was built. 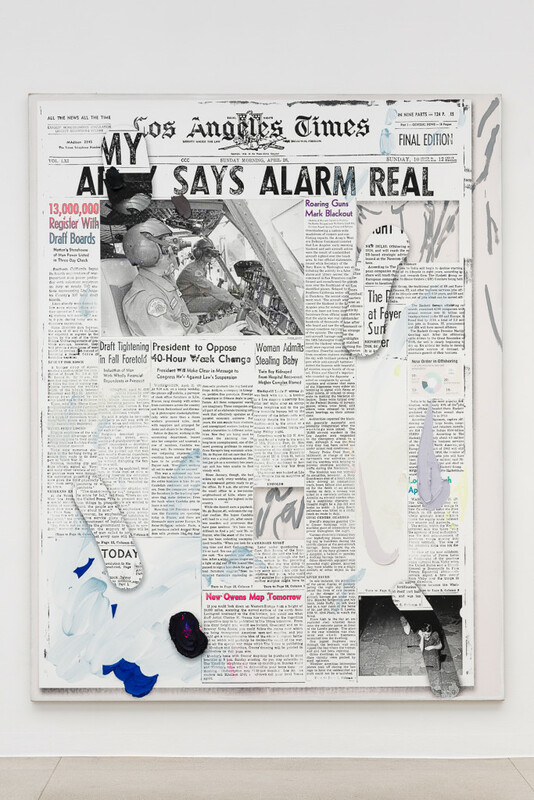 Owens was struck by the juxtaposition of world events in the months after Pearl Harbor alongside fait divers from a bygone era in her own neighborhood. To begin working with these images, she had rubber cast made of the original negative plates in order to make prints. The scans of the reprinted newspaper plates were edited in Photoshop before being screen-printed on canvas. 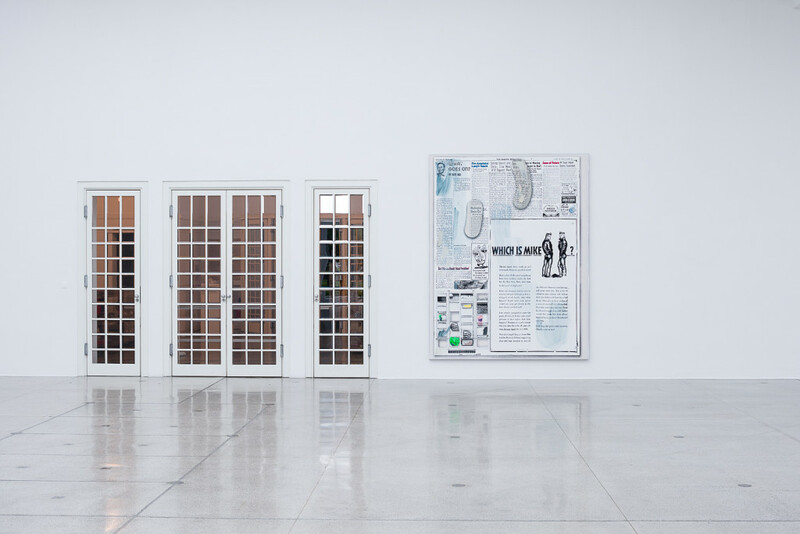 For Owens’s exhibition at the Secession, the paintings hanging on the wall represent individual pages but comprise a constructed idea of the newspaper as a whole. Textures, colors and images repeat and continue from painting to painting just as the front-page article of a newspaper might continue on page 6. The artist began to work with compounded images of time following an exhibition at Capitain Petzel, Berlin, that included a short story spread across five freestanding, double-sided paintings with an ending that continued on a separate still life painted in the style of her own earlier work. For the new works, she has digitally manipulated the original World War 2-era Los Angeles Times to include both recent news and advertising from contemporary publications and websites alongside even older content dating as far back as the 1890s. While some fragments contain clear references to a specific era, others are not so easy to place historically. At a glance, the sources within any given painting never cohere into a clear chronology of then and now. 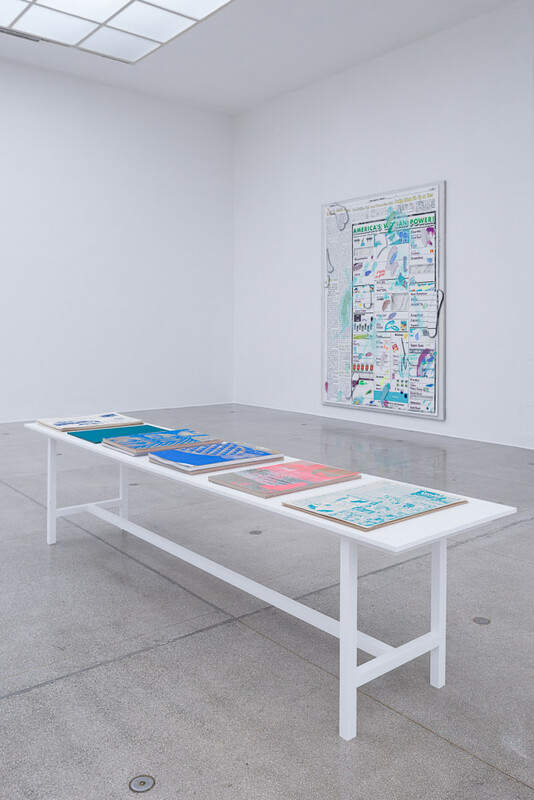 Laura Owens’s paintings place these digitally edited newspaper pages ambiguously between the foreground and background of an unstable pictorial space. Trompe l’oeil shadows fall under the real shadows cast by thick impasto and digital brushstrokes float on the surface alongside actual oil, acrylic and Flashe paint. These shifting spatial cues further complicate the displacements of old and new across the image. 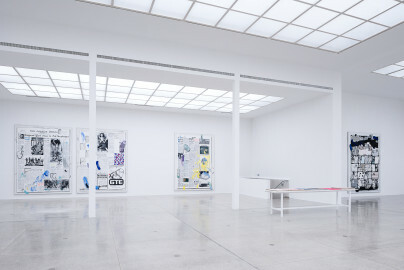 Like in earlier solo exhibitions by the artist, Owens’s show at the Secession presents her pictures together with a series of handmade artists’ books created in connection with her work on the large paintings. The visitors are encouraged to page through these books, which are both autonomous works and preparatory studies. Next to the overwhelming physical presence of the large-format pictures, the books represent a more intimate sphere of the production and reception of art: they are witnesses to the creative process that produced the paintings and highlight selected aspects, motifs, or ideas. Laura Owens, born in Euclid, Ohio (USA) in 1970, lives and works in Los Angeles.